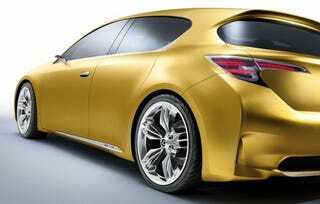 The Lexus LF-Ch concept will debut at the Frankfurt Motor Show and will lead to a production FWD, 5-door hatchback designed to rival the Audi A3 and BMW 1-Series. While the concept wears hybrid badges, expect the production vehicle to offer a range of powertrains starting with a plain-old earth-killing inline-four and ending with a full hybrid capable of limited-range and low-speed electric-only operation. We'll get a better idea of which Toyota platform this is based on when we see it live later this month. Reinforcing Lexus' position as the only manufacturer to offer a range of hybrid vehicles, the LF-Ch concept will make its world premiere the 2009 Frankfurt Motor Show. LF-Ch combines stylish design and full hybrid technology in a practical 5-door compact package to fulfil the needs of the most demanding premium compact segment customers. Benefiting from an electric-only driving capability, a key feature of Lexus Hybrid Drive, LF-Ch will allow for virtually silent urban driving with zero emissions.